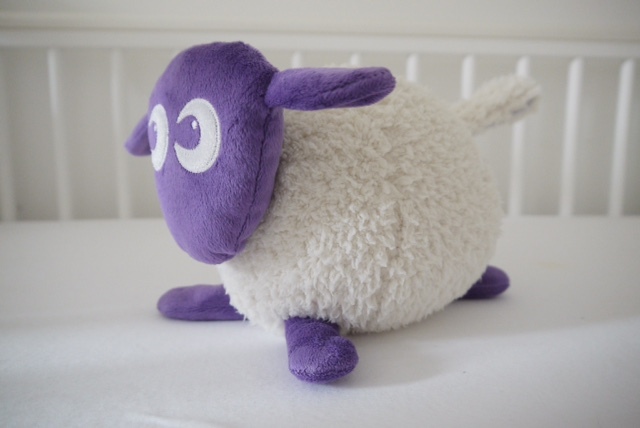 Let me introduce you to Ewan The Dream Sheep or otherwise these days known as Ewan the GOD SHEEP...funny huh! 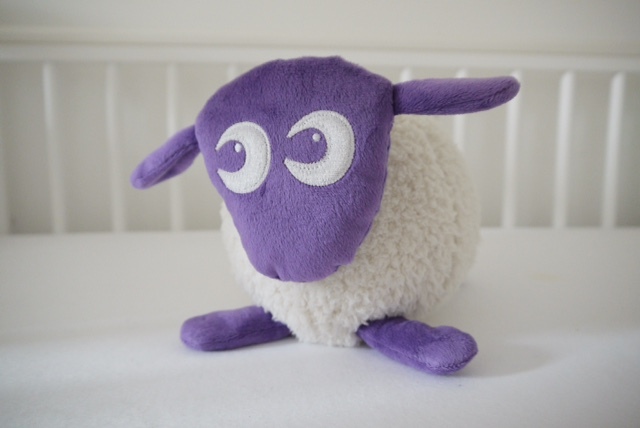 This sheep looks like a soft cuddly toy but it actually does a lot more...it emits soothing sounds at a low based frequency and has a calming pink warm glow on it's chest. When all these factors combine it helps settle and soothe babies / toddlers into peaceful sleep. I am sure there are plenty of these things online all claim to soothe and send babies to sleep and there is big money to be made for sure as a desperate parent will try anything for a few hours of unbroken sleep! Nicole's generally quite good she will sleep from 11pm - 3-4am for a feed then the next one could be anywhere between 5-8am depending on the last feed which seems to be really good for 8-10 week old. Soon as the teat comes out of her mouth she would be fast asleep so I don't have to worry about settling her back etc.. I have read on forums mums getting up lots more during the night to satisfy the little one or they just simply won't go back to sleep and you end up rocking or doing all sorts for hours. So let me tell you a bit more about this furry thing... in each of Ewans legs there is a button to press for different sounds from womb heart beat, vacuum cleaner, harp and rain. Each of the sounds lasts for 20 minutes and they are recorded at the low base frequency which is why it works well for settling the little one. The womb heart beat noise are actual recordings! 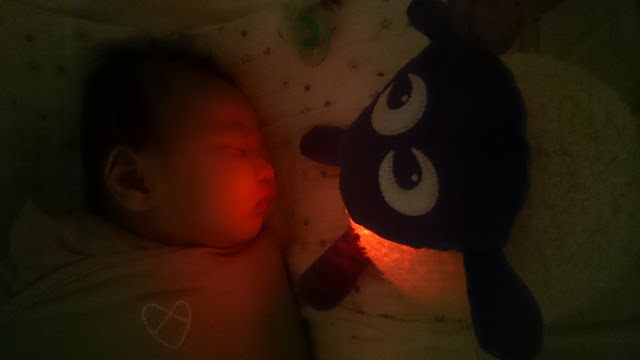 The pinky/red glow colour comforts the baby as this is the colour they see inside your womb. 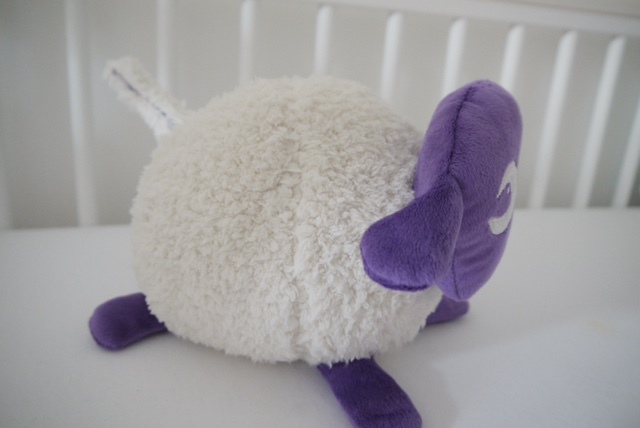 His tail has velcro so you can attach it to your cot / pram or anywhere you wish and they suggest you do this for the first 12 months. So how did we discover Ewan.... when Nicole got to around 11 weeks we noticed she was sleeping well generally and music helped her fall asleep very quickly as fast as 10 minutes and as long as 20-25 min but she would often sleep for a few hours and wakes up for feed or she would wake up sounding very annoyed like someone has woken her up. I ended up observing her one evening while she was sleeping and noticed she has no problems sleeping but often she would get woken up by her arms flapping around in the air or knocking her dummy out (she pushes it out when she's asleep) after she has fallen asleep. Quick google around and reading forums this was actually called startle reflex on the arms and the solution seems to be swaddle until they grow out of it around 4-6 months. Another google around for suggested swaddles we ended up picking swaddleme and paid for next day delivery (sleep is priceless) from Amazon. I was worried about swaddling as we have never done it, we have heard mixed reviews and we were not sure how she would take it but it was worth a try at £12.99 for the swaddle, for us we are lucky that she is a very chilled out relaxed baby so she took to it well and it didn't bother her. Also instead of using our phones for white noise hubby done some research online and Ewan popped up on Amazon and John Lewis online with great reviews he decided to give him a go with the £25 gift voucher we received - he cost £29.99. The only downside to Ewan is he drain's battery's so it's worth investing in rechargeable ones and have plenty of spares ready. You will need to use a screwdriver to change the battery's for safety reasons but that's no problem if it means you can get back to sleep. So with these 2 combined on the first night she slept from 9.30pm-11:30pm which was normal (we dream feed her then swaddle her) then she slept until 7.30am and since that night she's been sleeping well every night. Some nights I would hear her wake around 3-4 am out of habit I would get up (no turning on lights) and just pressed one of Ewans legs for sound and pop the dummy in and she would fall back asleep instantly. I have to admit some nights I could be doing this a few times but eventually after a week she would wake up less and less or later in the night which is good enough for me...I think as she gets older and able to drink more milk she will sleep through even better. Some mornings I can hear her awake but she seems quite happy to lay in bed until I wake up to change her nappy / feed her and often this is around 8.30pm. So there you have it we finally cracked it on the sleep at 12 weeks... This isnt fixed daily of course, like us we wake up at different times during the day and sometimes she will wake between 5-6am so I would just feed her and she will fall back asleep until 7.30-8.30am so it's still manageable! This could all change next month who knows but for now I am enjoying it very much. I realise each baby is different and my advice is to observe your baby and google what you see and read forums to see what others are experiencing. Sometimes little changes can mean that extra 1 hour sleep which is amazing if you are really struggling. If you have missed my previous post on - Tips On Getting Through Your First Month With A Newborn you can read it here.